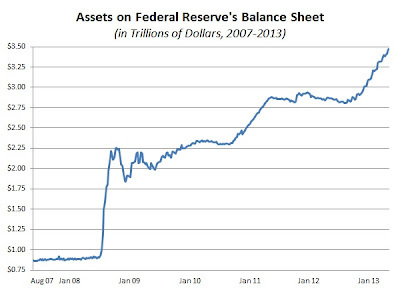 The Fed's balance sheet grows in size when they print money to purchase an asset. They provide the printed money to the entity (called a primary dealer) who provides them with the asset. This process is known as Quantitative Easing (QE). The assets the Fed has purchased since the crisis began in 2008 have been exclusively US treasuries and mortgage backed securities. When the Fed takes these assets back, it puts them on their balance sheet. As they accumulate more and more assets (currently at the rate of $85 billion per month), it causes the total size of their balance sheet to grow. As of mid way through 2013, the Fed held approximately $3.5 trillion in assets. It is projected that they will cross $4 trillion by year end. In addition to providing all the wonderful effects to the economy that we have already discussed (lower interest rates due to their demand in the bond markets), the Fed receives income on the assets they purchase. They return 95% of their profits to the US treasury, which shows up as income and reduces the annual deficit. This wonderful arrangement is similar to the one currently taking place with Fannie and Freddie, where they return their profits to the government, also reducing the deficit. If this is such a magical process, why has the Fed not always purchased 100% of the US treasuries issued and 100% of the mortgages purchased through the government sponsored entities Fannie and Freddie? Asking yourself this simple question, which I hope is easy to answer, explains how devastating the reversal of this process will ultimately be for the economy when either the Fed stops the program (they won't) or the market forces them to stop (it will). We're going to move beyond that issue for a moment and look at another looming problem the Fed faces down the road. It is the well touted "exit strategy" that the Fed has told us about since the first round of QE began. Additional money in the system takes on the form of inflation. This does not always mean it leads to the price of computers, clothes, or food rising. Inflation can come in the form of financial asset appreciation (currently seen in the US stock and bond market bubbles) where new money has flooded instead of entering the actual economy. If the money velocity were to rise again (which it will), then inflation will move beyond the current bubbles in the financial markets and enter the economy. Then you will see a significant rise in what consumers pay at the gas station, grocery store, doctor's office, clothing stores, utility bills, and everything else needed to live day to day. While the Fed loves the asset bubble inflation it is currently creating, it does not like the real world inflation that is coming. So far the Fed has experienced only the good inflation, which is why they are considered god like. If consumer prices were ever to begin rising at a rapid rate (they are currently only rising about 1% annually), then the Fed has told us they would reverse the QE process and bring the money they have created back out of the system. In a 60 Minutes interview, Ben Bernanke has told us he can reverse this process in 15 minutes. This is lunacy. When the money is printed and enters the bloodstream of the economy, it is letting the genie out of the bottle. The Fed has no control over where money flows once it leaves the printing press. It can only hope and pray that it goes somewhere productive. Beyond this idea that the money will just be waiting in a garage for them to pick up (it won't), they face another major problem. The Fed's balance sheet discussed above is composed almost exclusively of treasury and mortgage bonds. If interest rates rise, then the Fed takes losses on its portfolio. The Fed is structured as an entity that is never forced to market their book to market as long as they do not sell the asset on their portfolio and just let it run to maturity. In other words, imagine the Fed has $100,000 in 30 year government bonds and rates double cutting the value of those bonds close to $50,000. The Fed is not forced to show a $50,000 loss because they tell us they can just hold the bonds for the full 30 years and collect the full $100,000 at maturity. This is true. The Fed has told us that they can reverse their QE process in 15 minutes. How do they do this? Instead of printing money to purchase assets, they sell assets on their portfolio in exchange for cash in the system. This drains liquidity from the system. Did you see the important part of that process? Selling assets on their portfolio. If they sell an asset before maturity they will be required to report it as a loss. The Fed holds very little capital to cover losses and would need to request a loan from treasury in order to cover the shortfall. Instead of lowering the annual deficit, the Fed would be an addition the total debt burden. The issue becomes even more concerning with the rippling effect into other areas. If the market knows that the Fed is a seller, instead of a buyer, it will front the Fed's trades and dump US treasuries and US mortgages causing rates to spike further, creating greater losses, and making it even more difficult for the Fed to sell assets. The treasury will need to issue more money to cover the losses, causing the deficit to grow higher, creating even more selling in the treasury market. On top of that, as the Fed (and market) are selling assets it is causing rates on US treasuries to rise and increasing the total annual debt burden. For every 1% move in US treasuries higher, it creates an additional $170 billion just in annual interest payments ($17 trillion deficit). What if rates moved up 3, 4, or 5% back to a normal level? (Hint: they will). This is why the Fed has painted itself in a corner. If they lose control of the markets, their only option is the nuclear strategy to increase QE further and further and further. The bond market will eventually reject this level of stimulus as further debasement to the underlying asset. How far away is this process from occurring? It could have begun in June with the first rate shock higher or it may be years away. Its ultimate arrival is inevitable. Up Next: 2013 Second Half Outlook: What Is An Interest Rate Swap?